Diomansy Kamara has been signed by NorthEast United for the 2015 Indian Super League season, bringing another element of attack into César Farías’ squad. Kamara, who lists the likes of West Bromwich, Fulham and Celtic in his playing career resume, has also represented Senegal at three Africa Cup of Nations. 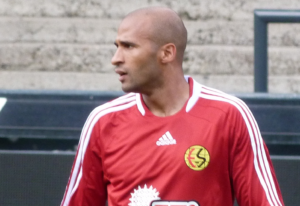 The Senegal international’s signing follows Portuguese international Simao joining as the club’s 2015 marquee. NorthEast United fans will be hoping the combination of the two will add goalscoring prowess to the club, that was sorely missing in the 2014 season. Kamara gained fame in the footballing world for his unique goalscoring celebrations, seen in the video below.